ESPN will go to Pullman, WA for the first time ever for College GameDay. Washington State fans have long been waiting for their chance to host ESPN’s College GameDay, and their patience is about to be paid off. Cougar fans, College GameDay is comin’ to your city. Kirk Herbstreit recorded a video message shared by the official Twitter account of GameDay to share the news. 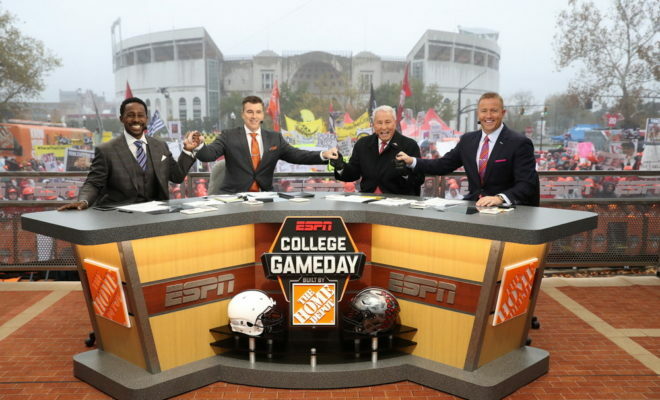 After reflecting on what was a wild and crazy day of college football that may see a bunch of detours for the season en route to the College Football Playoff, Herbstreit says there was just one place GameDay could go for Week 8: Washington State. GameDay has never made a trip to Washington State in the long history of the traveling pregame show, but that hasn’t stopped Washington State fans from leaving their mark on the show. Each week, a Wazzu flag is flown by a volunteer on the scene wherever GameDay is setting up around the country. Seeing the crimson flag of Washington State fly in the background of the GameDay set has been every bit a part of the GameDay tradition as Lee Corso donning the mascot head of his big pick of the day. ESPN has tried to find excuses to get out to Washington State in recent years as Mike Leach and the Cougars have become relevant in the Pac-12, but the right opportunity never quite presented itself for a variety of reasons. But next week, ESPN decided the time was right to reward Washington State fans for their dedication. With Oregon winning their Week 7 game at home against Washington to go to 5-1, next week’s game at Washington State will pit a pair of 5-1 teams against each other in what has become a pivotal game in the Pac-12 North. The Pac-12 North contest figures to be a great game worthy of the GameDay treatment, because the rest of the Week 8 schedule lacks some sizzle on paper. Forget about GameDay signs next week. Expect to see all of the WSU flags in the state show up for a long-awaited banner day for the Cougars.